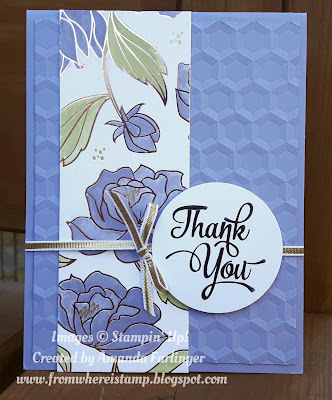 From Where I Stamp: Final Day of Sale-A-Bration! Today is the very last day to take advantage of Stampin' Up! 's Sale-A-Bration! You can place an online order with me right here and earn a free item with every $60 before tax and shipping order. Today's card features the Springtime Foils Speciality Designer Series Paper. I coloured in the leaves and flowers using Wisteria Wonder and Pear Pizzazz Stampin' Write Markers.